Welcome to the Freeola Internet customer support pages. This guide is designed to help with publishing your web site using FireFTP for Firefox. For more Internet help topics please visit our main Support Page. Firefox is one of the most popular browsers to date, boasting a huge 25% (roughly, and this is likely to change) of the current browser market share. FTP access is generally considered separate from viewing the web, however for those that like to keep everything in one package, Firefox's extensions can prove handy. The extension in question is called FireFTP. This small add-on is completely free and can be found and downloaded from the Mozilla web site. 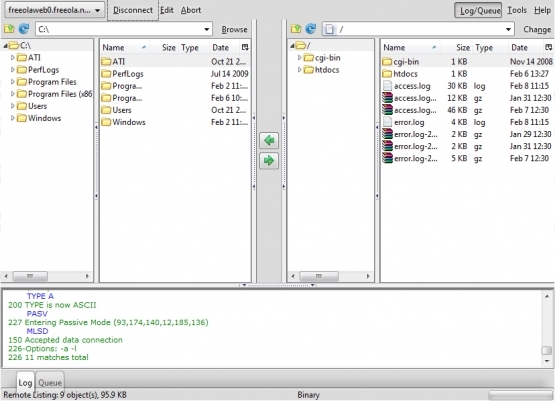 The look, feel and usage of this extension resembles the majority of dedicated FTP software such as FileZilla, the set up process is also fairly similar. First of all we will need to install the extension, to do so you can visit the developers web site, which can be accessed by clicking here. Once you are on the page, you need to click the Download link. We should then be given a security message by Firefox giving you the ability to install additional software, all files will be stopped from installing by default, otherwise any site could install software. Only if you are certain that your message states exactly what the example message states, and that you are certain that you are on the right site then press the Allow button. You will be asked to confirm the installation of the software, follow the on screen prompts, after which you will be asked to restart Firefox. FireFTP should now be installed in Firefox. 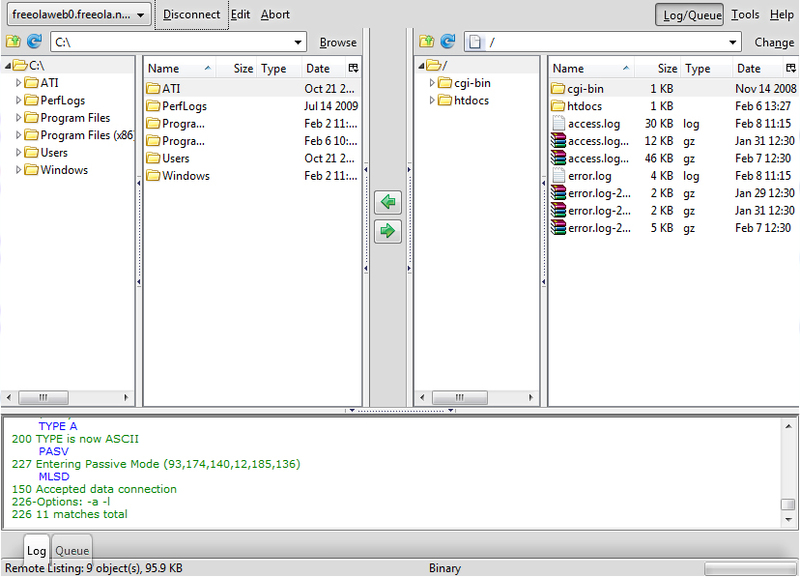 To open FireFTP you will need to go to your Tools menu and select FireFTP, this will then open up a tab within Firefox. Select the Create an account button from the very top left hand corner, this should open up a window called Account Manager. At this page you will be asked for your FTP details for your web site, these can be found by logging into your MyFreeola account and selecting the My Websites link. On this page click Options & FTP Settings next to the relevant site. Host: This is the address for the web server that your web site is hosted on. This will be in the form of freeolawebX.freeola.net for standard hosting customers or vipX.freeola.net for VIP Hosting customers. Login: This will be referred as the FTP Username in your MyFreeola account. For Standard Hosting sites this will begin with sr, for VIP Hosting sites this will begin with vip. Password: This will be referred to as the FTP Password in your MyFreeola account. By default this password will look fairly random and will consist of 8 characters. Passive Mode: This will need to be enabled/ticked. Any other settings on the set up pages are not required, but can be set up if you wish. Once you have provided the stated information press the OK button. Now you will need to select the account from the drop down list, found in the top left hand corner. Once you have done so, press the Connect button. If successful you should see your web folder and files listed on the right hand side menu. As you will see, the left hand side of the page will allow you to browse the files that are on your computer, where the files on the right hand will show you the files in your web folder. First of all, using the right hand side of the screen, you will need to open up the 'htdocs' folder, as this is where your web files need to go. Using the left hand side of the screen, you will need to locate the files that make up your web site, once you have found them you can click the right facing arrow towards the left of the page. Your files will now be uploaded to the web server, you will need to wait for this process to complete. Once this has completed your files will have been uploaded and your web site should now appear, given that your web site has been created correctly and the initial page is called 'index.html, index.htm' etc. You can now select the Disconnect button from the top of the screen and close the window or tab. 220-You are user number 4 of 100 allowed. 220-Local time is now 06:50. Server port: 21. From looking into your account it seems that you are currently trying to upload your files without the use of a Freeola internet connection. You will not be able to upload your files from a non-Freeola internet connection without first signing up to our VIP Hosting service. Freeola's unlimited web space offer is designed to be used in conjunction with a Freeola internet connection. For free access to your Freeola web space, you may use one of our dial-up numbers (0845 604 3070 or 0845 604 3080 - see http://freeola.com/dial-up-internet/ for details), or Freeola Broadband (see http://freeola.com/broadband to try it for �9.99). If you have a broadband connection from another provider, or are otherwise unable to use a Freeola internet connection, we offer a product called Freeola VIP Hosting. This allows you to upload to your web space from any computer or internet connection in the world. This product is currently available for �3.49 + VAT per month for each web space (payments are charged on a quarterly basis). To purchase this product please sign up from the 'VIP Web Hosting' section of your MyFreeola account.